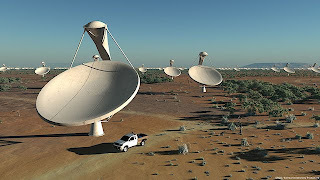 This article follows on from yesterday's discussion of the Square Kilometre Array (SKA) project. 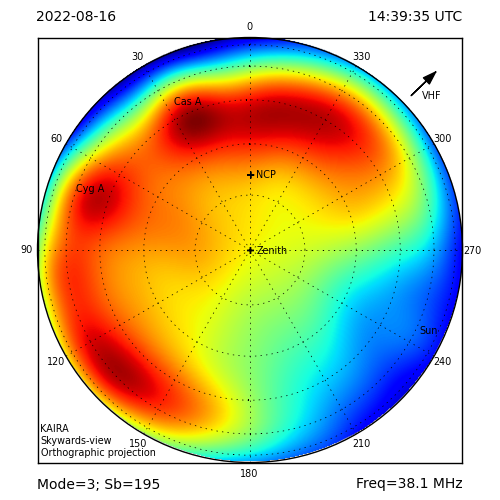 The SKA will operate over a wide range of frequencies (70 MHZ to 10 GHz) and, like KAIRA, it will be split into different antenna arrays to cover these different frequency bands. The reason for this is that there is no single antenna design that can cover the entire frequency range efficiently. 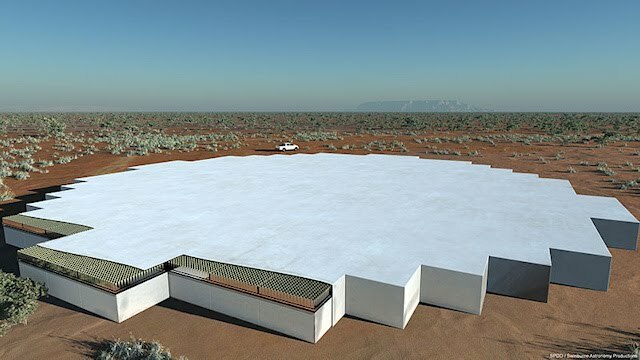 As a result, the SKA will comprise arrays of three types of antenna elements. These arrays are referred to as the SKA-low, SKA-mid and SKA-dish arrays. 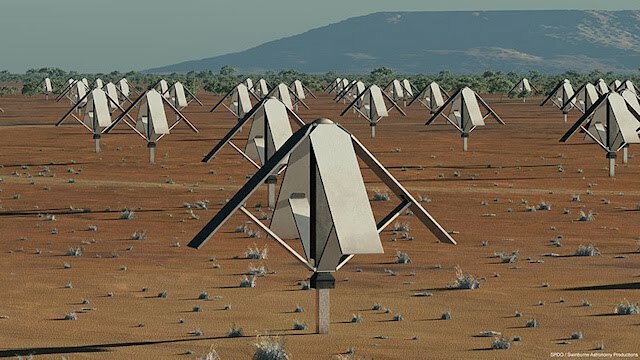 The SKA-low array uses simple dipole antennas to cover the frequency range from 70 - 200 MHz. These will be grouped in 100m diameter stations each containing about 90 elements. 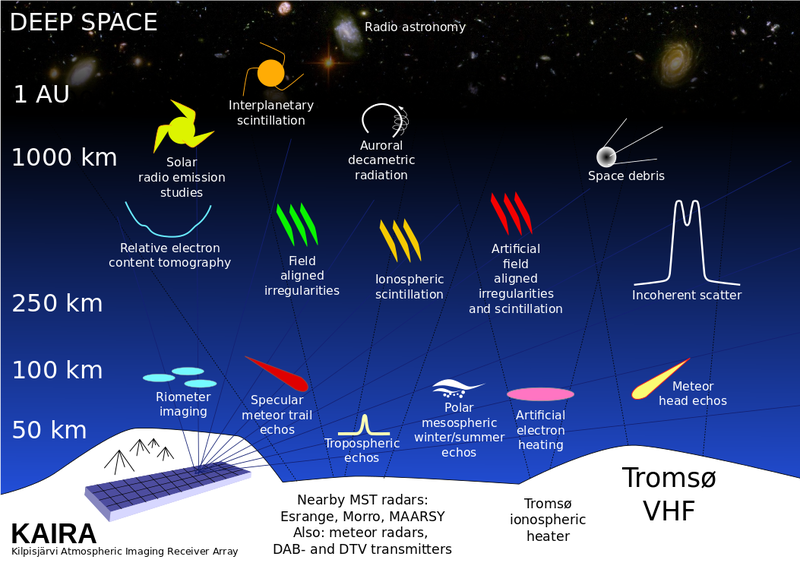 This system is very similar to the existing LOFAR Low-Band Array layout. The SKA-mid array is again LOFAR-like. It will most likely comprise more delicate antennas, assembled into 'tiles', which are then configured into arrays. These tiles cover the medium frequency range from 200 to 500 MHz, with tiles clustered together into circular stations. An artist's impression of the SKA-mid tile cluster. The SKA-dish array will have several thousand antennas in the more traditional 'dish' form to cover the frequency range 500 MHz to 10 GHz. The plan is to equip these dishes with focal plane arrays at their focus to increase their field-of-view (a limitation of traditional dishes). 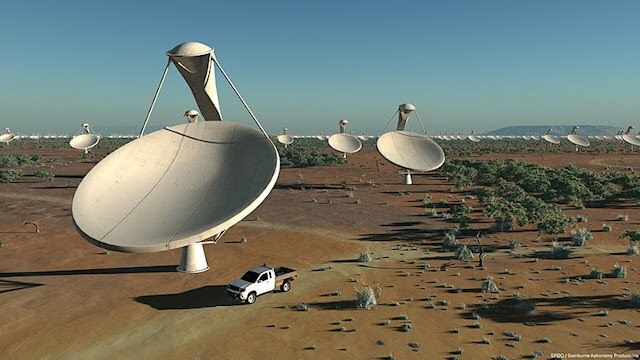 An artist's impression of the SKA high-frequency dishes.